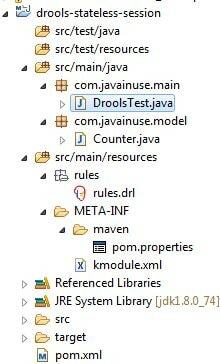 In previous chapter we implemented a drools project using KieSession to get stateful session. In this tutorial we will try to understand the difference between drools stateful and stateless session using example. Stateless session that forms the simplest use case, not utilizing inference. A stateless session can be called like a function, passing it some data and then receiving some results back. Stateful sessions are longer lived and allow iterative changes over time. 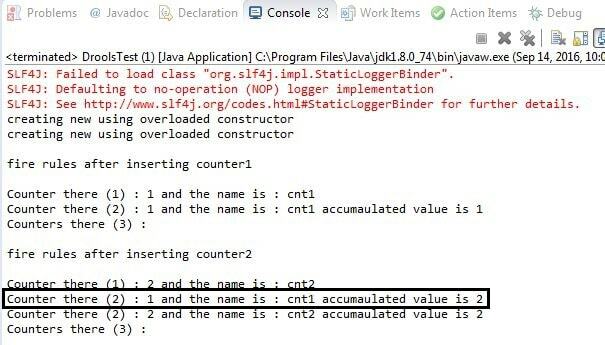 Next we execute the same rule file in stateful and stateless session environment and understand the difference. Finally we define DroolsTest class. Here load the facts and the rules in the drools working memory and firing all the rules. We make use of stateful session for firing the rules. //Dispose the session at the end. We have a stateful session here. Initially when counter1 is inserted and rules fired all three rules get fired. Later we insert counter2 and fire rules again. In this case the execution of rule "Counter shower 2" changes the value of cnt in working memory. As this is a stateful session so this rule is again executed for counter1 also as working memory value is changed. Finally we define DroolsTest class. Here load the facts and the rules in the drools working memory and firing all the rules. Here we obtain stateless session and execute the rules. * This is a sample class to launch a rule. We have a stateless session here. Initially when counter1 is inserted and rules executed. Later we insert counter2 and execute rules again. In this case the execution of rule "Counter shower 2" changes the value of cnt in working memory. As this is a stateless session each session gets disposed after getting executed. Any changes in the facts while executing rules is not made aware to the rule engine. Any changes in the facts while executing rules is made aware to the rule engine. 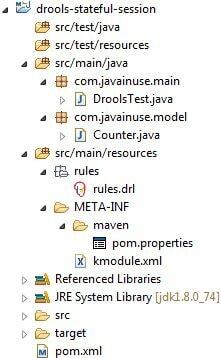 dispose() method is called automatically to release the session. dispose() method should be called to release the session to avoid memory leaks. The engine is caused to â€œfireâ€� via a call to one of the execute() methods. that contains the fact(s) that will be used. Provide a variety of methods to cause the engine to â€œfireâ€� (i.e. execute the consequences of rules scheduled for activation). Any changes in the facts while executing rules is not made aware to the rule engine so if any rule is modified no other re-activation of rules will take place. As any changes in facts is available to the rule engine so if a rule is modified for a particular fact, this change will re-activate all the rules and fire the rules that are build on modified fact.